Ixias have slender, wiry stems with tough, narrow leaves and spikes of star-shaped, brightly colored 1-2" / 2-5 cm exquisite cup-shaped flowers. The stems are so tiny it gives the impression that the flowers are just hanging in thin air. The plants are as colorful in bud as when the flowers open in the warmth of the sun. 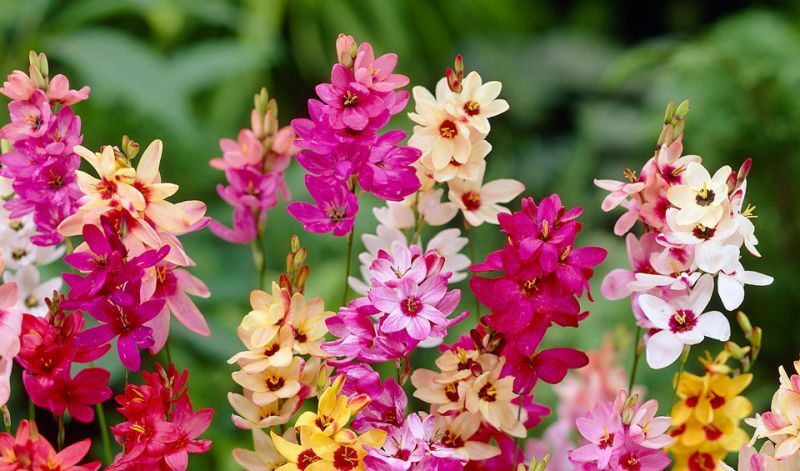 Their pleasing fragrance will attract plenty of bees and butterflies. In Europe Ixias are a florist's delight. The long-lasting cutflowers are frequently used in mixed bouquets. Cut them when the second flower on a spike has opened all the way and immediately put them in water. Usually mixed: pink, red, yellow, purple-red, white & cream. In borders, beds, perennial gardens, pots and as cutflowers. Usually only sold as 'Mixed Colors', occasionally by color: 'Giant' (white), 'Hogarth' (cream), 'Panorama' (purple-red), 'Rose Emperor' (pink), 'Spotlight' (yellow & red) and 'Venus' (red).